This construction video tutorial provides detail information on road structures and it’s various sections. Besides, one can also get information on road cross-section. Sub Grade – It is considered as the natural surface of the road. It’s thickness is 60 cm. It is situated 2 feet high from the ground level so that the water can’t enter into the road. Subgrade is taken as the soil surface on which a succeeding layer or layers of base course, gravel surfacing, surface treatment, pavement or other material is to be placed. Sub Base – It is not considered as the vital part of the road. It is used when the quality of sub grade is inferior. It belongs to the layer of aggregate material arranged the subgrade, on which the layer of base course is situated. It is not required if there is only foot traffic on the pavement. But it is essential when vehicles run on the surface. The thickness of sub base depends on the design of the road. 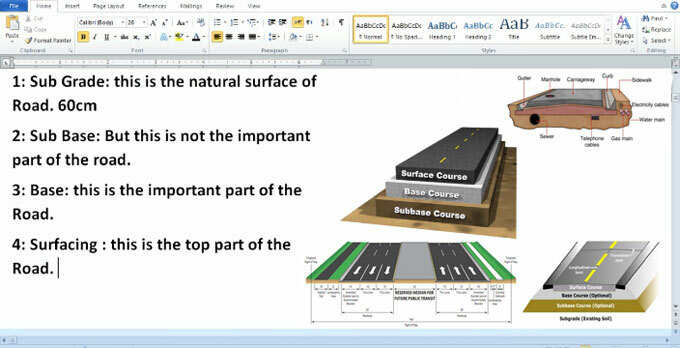 Base – It is the most crucial part of the road. The depth of the base also depends on the design of the road. Surface – It belongs to the top most part of the road. It is the long lasting material that is placed on an area designed to retain vehicular or foot traffic. On road surface, asphalt or concrete is arranged a compacted base course. Now-a-days, permeable paving methods are being utilized for low-impact roadways and walkways.